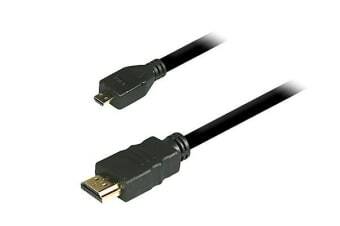 This cable provides high-speed connections and enables you to view content from your tablet, smartphone or ultrabook on a monitor or projector. This Micro HDMI to HDMI cable (Male to Male, 1.2m) enables you to connect and project content from your tablet, ultrabook or smartphone on to a larger screen with effortless ease. Removing the any unnecessary adaptors, this invaluable cable lets you enjoy watching those holiday pictures from your tablet on the larger screen of your TV or projector in a hassle-free way. This cable also lets you take full advantage of your IP-enabled devices without a separate Ethernet cable as it adds high-speed networking to an HDMI link. It did not get used .. The only thing with this product was it was not delivered at the same time as the monitor, it took an extra few days before it arrived. The products were of good quality and worked well.